Monday, July 14th, 2014 | 1:11 pm	and filed in Synthesizers, Gear. 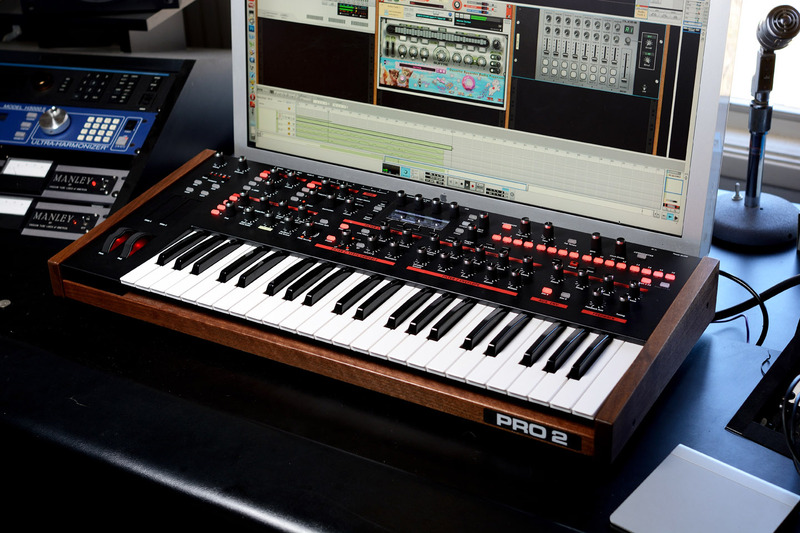 The Pro 2 Synthesizer is part of the new generation of keyboards from Dave Smith Instruments. Partly inspired by the classic Sequential Circuits Pro-One, and using the technology of the DSI Prophet 12, the Pro 2 is a monophonic instrument that can be a center of a synth production studio, but also has the capabilities to integrate with an analog modular synthesizer system. It’s been an honor to be asked back to the DSI sound design team to work on the Pro2. Over the course of the week of work, I archived some of the sounds to instagram and have collected the snippets here. I couldn’t really wait to try the CV/Gate i/o features of the Pro 2, and hooked it up to the Make Noise system with triggers coming off maths. Not surprisingly, the integration is pretty tight. There are some calibration controls on the Pro 2 which had to first be adjusted, but then it was nothing but pure fun routing to and from the modular system. The Pro2 has four oscillators and two analog filters. There’s a feature to route two of the oscillators to the Prophet 5 style low pass filter, and the other two oscillators to the Oberheim SEM style State Variable Filter. Using this routing feature, i’ve recreated a classic synth riff and sweep effect from Pink Floyd’s Dark Side of the Moon. The Two Filter sections can run in series or parallel or mixed in-between. Series is when the oscillator is routed first to the Low Pass filter and then into the State Variable Filter, Parallel is when the oscillator output feeds equally to both filters and the outputs are mixed. The four digital oscillators can be used as modulation sources or targets. In this patch, amplitude modulation and frequency modulation are intermixed to create tones that resemble classic Buchla tones. The Oscillator is digital and modulating the wavetables and processing it with the digital and analog distortion sections will get you some very brash and punchy bass tones. FM modulation of oscillators is initiated when you hit the pitch bend on this patch… that adds the growl to the screaming cat tone. Otherwise it’s just a funky filtered lead sound. The 32 Step Sequencer is pretty powerful and with some careful programming, you can make drum loops. The Reset button on the sequencer is used as a loop retrigger while various parameters are tweaked in real-time. Unfortunately I didn’t have time to tap the full power of this feature. The four oscillators can be split out in Paraphonic Mode. You can play four different notes on the keyboard but all four voices share the filter bank section. A bouncy part like this New Order riff sounds like it’s coming from a true polysynth. The internal feedback routing from the Prophet 12 is also available in the Pro 2. Along with some non-standard key tracking modulation and synced filter effects rendered this IDM fill sound. Gotta Have More Cowbell! This patch uses the Roland TR-808 approach of specifically tuned pulse waves to create the ringing effect. In this video, the Pro 2 sequencer is sending CV/Gate signals to the Moog Werkstatt. The Audio from the Werkstatt is routed back to the Pro 2 audio input and processed with the bit crusher effect and filters. The Pro 2 Sequencer tracks can be routed to four different CV out sockets. Here the minimoog model D is being triggered and sequenced by the Pro 2. Users of Propellerhead Thor Polysonic Synthesizer will notice that the modulation matrix looks very familiar!